Combining text with images is not only fun and engaging for your Participants, it’s also effective! The Image+ Template is the perfect tool for adding graphics and other visuals to your eLearning courses. Step 1: Select the Image+ Template from the ‘Presentation’ panel. 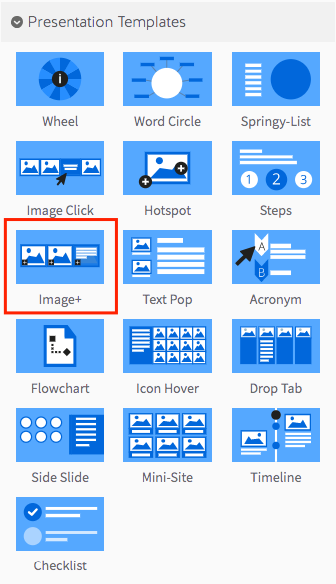 Step 2: Drag your Image+ Template into the Lesson Pathway. 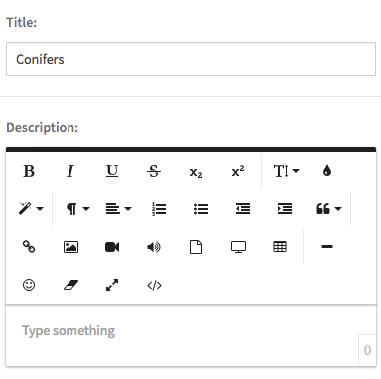 Step 6: Select a layout option for your Image+ Template. The first option will present all of your images in a row, which works best when you have a small number of images to display. 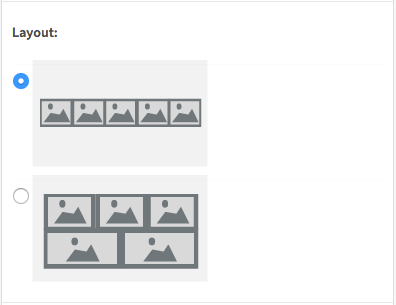 The second option will present your images in two rows, which works best for when you have many images. Step 8: To start building your Image+ Template, select the green ‘Add New Item’ button. Two rows: The minimum amount of images that can be displayed in two rows is 4. Size these images at 585 x 275 pixels each. For 5 images, try 3 images at the top with a size of 390 x 275 pixels, and 2 underneath at a size of 585 x 275 pixels. For 6 images, keep them all at 390 x 275 pixels. For 7 images, try 4 on the top at a size of 293 x 275 pixels, and 3 at the bottom at a size of 390 x 275 pixels. For 8 images, keep them all to 293 x 275 pixels. For 9 images, try 5 at the top at a size of 234 x 275 pixels, and 4 at the bottom at a size of 293 x 275 pixels. For 10 images, try 6 at the top with a size of 195 x 275 pixels and 4 at the bottom with a size of 293 x 275 pixels. Note: To add additional list segments, simply repeat the process.